Terry, the Quilting Husband (see previous posts “This is the Story of a Quilting Husband“, etc. ), has been hard at work piecing quilts. We just got back from the long-arm quilter THREE of his quilts and now they need binding sewn on and then sewn down to finish the quilt. 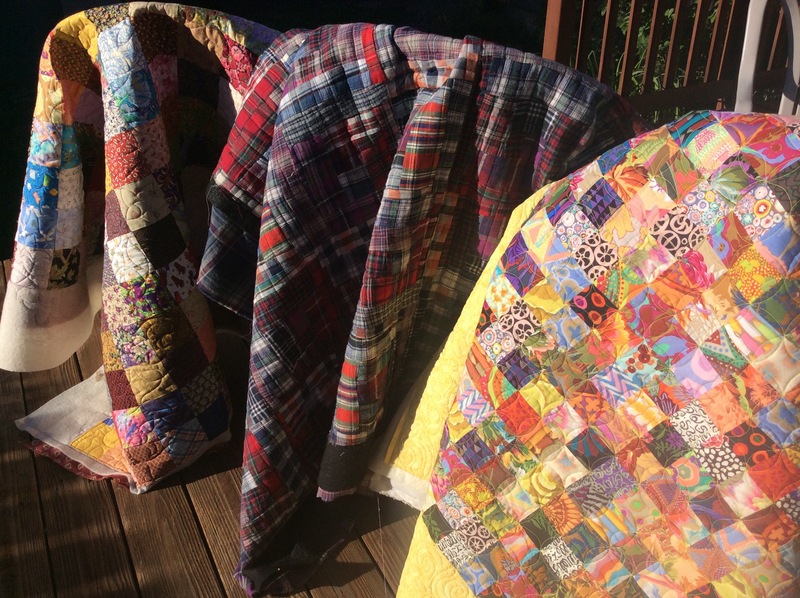 I am in charge of binding quilts – The Quilting Husband wants NOTHING to do with binding quilts. I have not pushed the issue as when I started quilt-making I was terrible at putting binding on quilts and sewing binding down. It was very frustrating for me, I just wanted to be done with making the quilt and not deal with the binding (I redid the binding many years later on my original quilts which looked like I had been taking mind-altering substances while binding…). I am happy he is quilting and I want him to keep enjoying the process, so I do his binding. Keep in mind I have my own quilts to bind too, but I will just take it on, one quilt binding at a time! Why do we keeping doing it (us crazy quilters)? Because it is fun and addicting!!! Oh awesome – I like the blog link and the photo of the dentist with a smile mask!